Work emails on a non-PDA? Surely the work of the devil! American network operator Sprint intends to crack the BlackBerry and PDA monopoly by allowing users to access their work accounts on 'normal' phones. The Sprint Mobile Email Work will allow access to Microsoft's Exchange server or IBM Lotus Notes. The service will be available on a variety of mobile handsets, including the new Samsung Instinct, which is mentioned around 40 times in the press release. 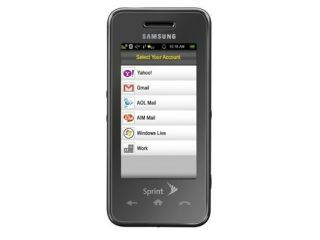 "Sprint Mobile Email Work will allow customers to read and respond to their business email and look up work contacts from a wider variety of Sprint phones, including the new Instinct," said Kevin Packingham, senior vice president of product and technology development for Sprint. "With combined access to corporate and personal email in a single application on popular consumer-friendly phones, Sprint customers can increase productivity and stay connected whenever and wherever they want." The idea is to access the huge segment of business users who use two phones for work and pleasure, much as Apple is doing with the recent release of the iPhone 3G. The service is included in a number of tariffs, but is available for $9.99 (£5) per month for all others. Though surely work will pay it for you?